So this spring and summer so far has been wet. It won’t stop raining. Not only have we not been able to plant the majority of our crops, the soggy and wet weather has created other problems. 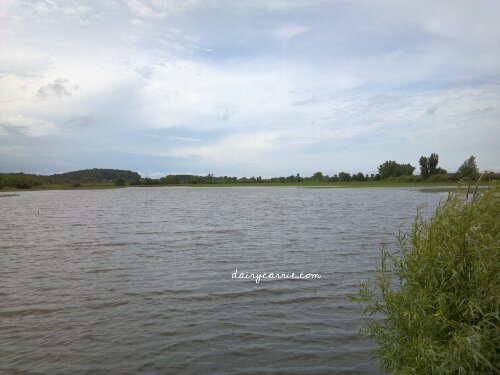 This is supposed to be a corn and soybean field not a lake. 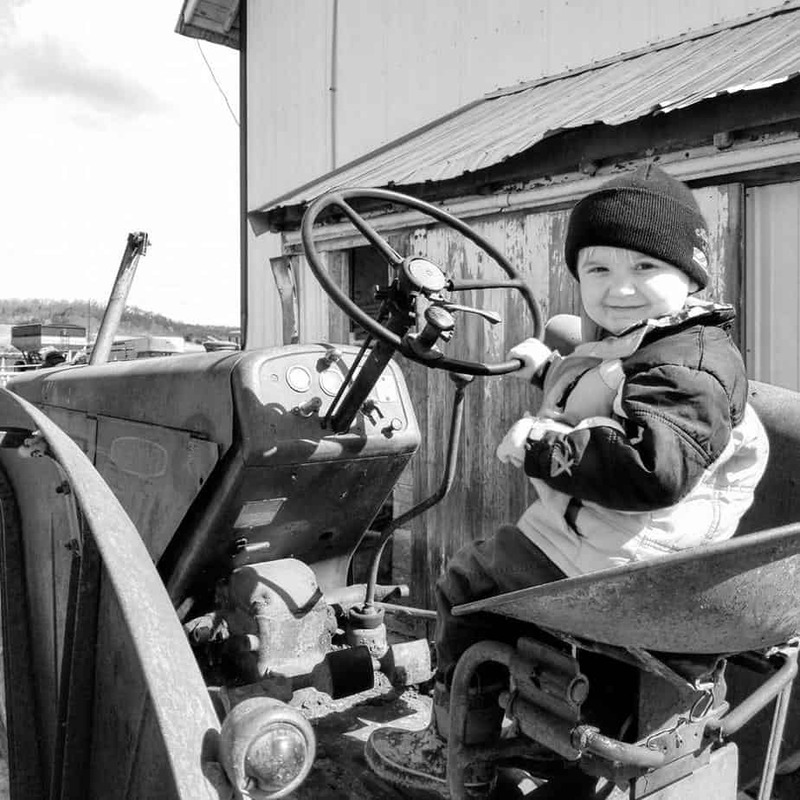 We work with an independent crop consultant named Tom. During the growing season Tom checks our crops and advises us on what they need, from fertilizer to herbicides or insecticides. He lets us know when our crops are at their peak for harvest and what our soil needs to be healthy. 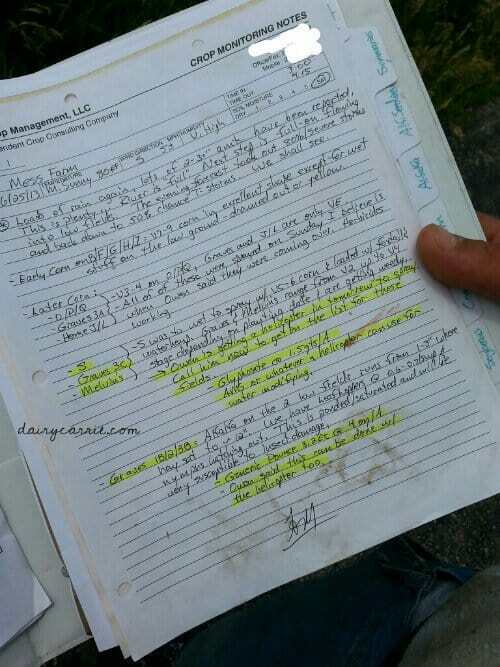 When Tom comes to the farm he writes up a report like this. It tells us what he found, what inputs our crops need and how much of each input to apply. 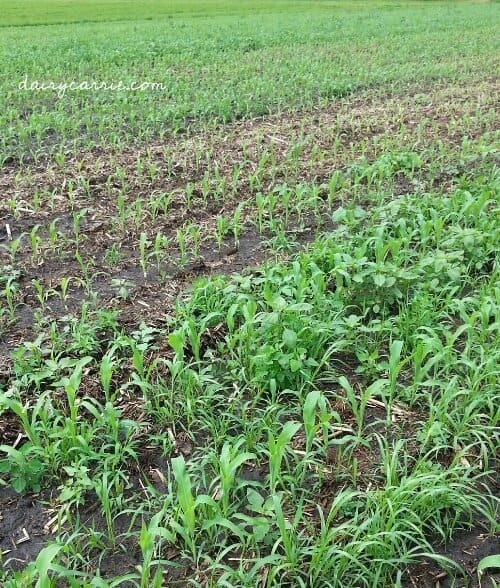 On our farm we plant a mix of crops, like corn, soybeans, alfalfa or sorghum for our cows to eat. Some of these crops are genetically modified to resist glyphosate herbicides like Roundup. On years like this year where the only thing growing really well are the weeds, we are thankful that we have the ability to use glyphosate to manage the weeds. I know many people are against GMO crops, we have done our research and on our farm we choose to use them when we believe GMO seeds are the best option. This corn field is full of weeds and they are choking out the corn plants. Because the rain keeps coming the weeds are growing much faster than normal. Usually by the end of June our corn is much taller but this was planted much later than normal because the ground was too wet to plant. It’s so wet we have to use a helicopter to get our fields back into shape. 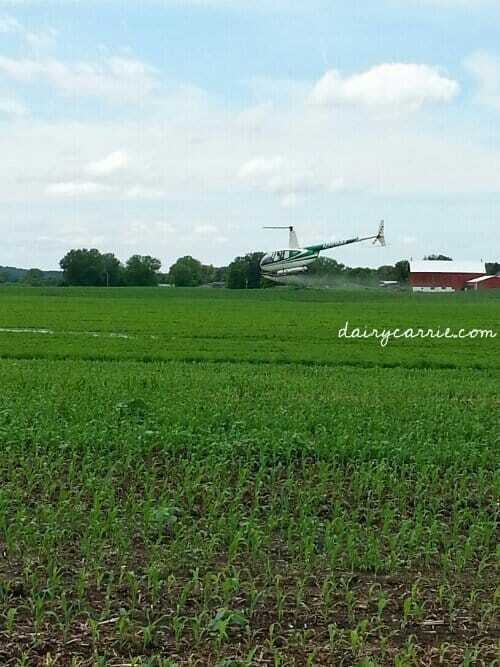 This helicopter is applying the insecticide our alfalfa needs to protect it from being totally eaten by bugs. The helicopter pilot uses high tech tools like GPS and mapping apps to make sure that the spray is only applied to the specific areas that need it. You can see how low the helicopter is flying while it applies the insecticide to our alfalfa. This ensures that the insecticide goes only where it’s supposed to. While a helicopter doesn’t use any more of the spray we are using than a regular spray rig, having to use a helicopter is going to cost us almost double the normal application cost. Inputs like fungicide, insecticide or herbicide are expensive and deciding to spray a field isn’t something that gets little thought. If we thought that a field didn’t need to be sprayed we wouldn’t. 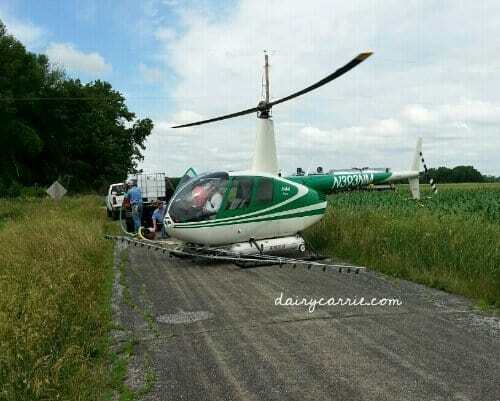 The extra costs of having to use a helicopter is going to make a big dent in the farm checkbook but doing nothing would result in no feed for our cows and that can’t happen. Hubs and I watched the helicopter work for a little while. I don’t think i’ll be signing up for a ride with this guy any time soon! What are your questions about crop spraying? I’ll fully admit that the cows are my area of expertise but I’m happy to answer your crop spraying questions too! 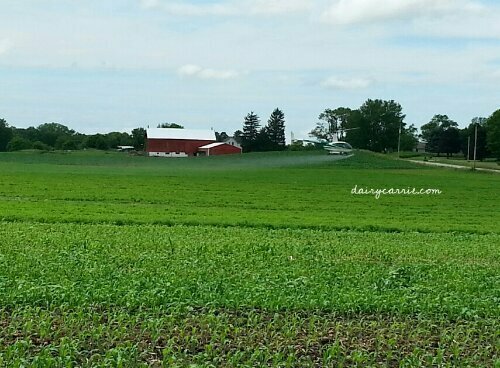 19 Comments on Spraying our fields. Excellent post, great detail without getting too long and wordy, something I lack in my writing! Best of luck for the rest of your growing season. 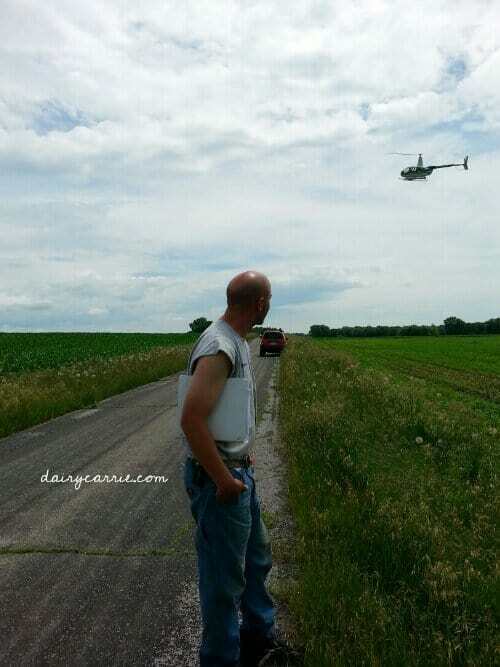 I had to use a helicopter for the first time in the early 70’s on drilled beans. It didn’t cost much more than using our own sprayer at that time. The helicopter owner was a young Vietnam Vet who was happy to get the work and I think he was also happy no one was shooting at him. Good stuff! Thanks for the link to my post! I am totally naive on this subject and, yet, completely fascinated by the process. 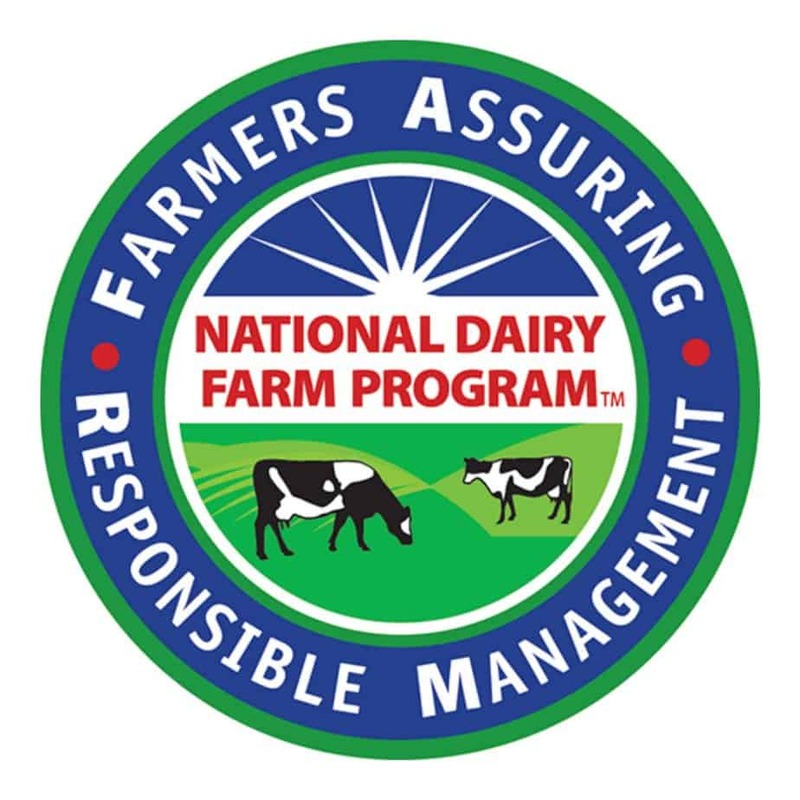 My question is this: since the insecticide is sprayed on the crops that are ultimately fed to your cows…does that have an effect on the milk they produce? Is it harmful to humans as a byproduct down the line? I’m a newcomer to your blog and just interested! 🙂 I can imagine that would be super expensive to have to hire a copter for the job! Thanks for stopping by and commenting! My understanding is the insecticide is broke down long before the cows eat the feed it was applied to. Are you concerned about some new studies that are suggesting there may be a link between stomach inflammation, enlarged Uteri, or HBS in dairy cows fed GMO crops? I haven’t seen any credible, peer reviewed studies that show what you’re asking about. Before we transitioned to organic, we used crop dusters to spray our wheat fields. So fascinating to watch! And, like you, I don’t think I would be asking for rides from any of the pilots! Those guys are nuts! 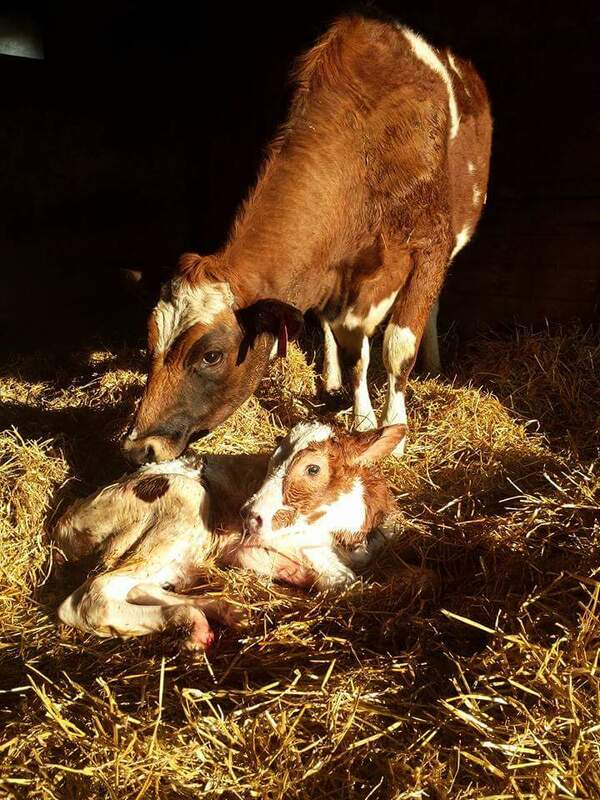 Wishing warm, sunny days for you so your cow foods can grow well! Lots of people don’t understand that driving across muddy fields doesn’t just mean you may get stuck or make a mess 😉 but it really messes with the soil profile. The compaction and all can wreak havoc on crops! Cool seeing the copter go to work…. I’ve seen them in rice several times. While I can only imagine how frustrating/costly/aggravating/awful etc. this experience is…I truly appreciate you sharing it. If sending warm, dry thoughts your way would be at all helpful, I would be the first to do so. Best to you, the Hubs and “the girls”! I’m a UAV/UAS developer, and I’m working on a platform that would allow farmers to use our heavy lifting multicopter for spraying their fields. Unfortunately the FAA is still behind schedule on their rule making for commercial operations, so we may have to wait a bit longer for this to happen. The multicopter would easily lift 45lbs+ of payload, and fly for over 25 mins. We are working on an even bigger platform for serious lifting capabilities which should be comparable to that of the Yahama RMAX, at a fraction of the cost. I’m glad you have a post concerning pesticide use on your farm. Too often people know very little about what pesticides are used and why. I think this applies to farmers as well. I have been around pesticide use most of my life, was just helping plant roundup ready soybeans in a roundup ready sprayed field last week. That being said I have a lot of questions and am skeptical of many current farming practices. The WHO just listed glyphosate as a probable carcinogen. What would you as a farmer make of this? I know you will probably say something about peer reviewed studies and such, I would too. But our current use of this herbacide and others is very troubling to me. Did you know it’s used as a dessicant of cereal crops such as wheat to ripen it? Spray one day, cut the wheat a few days later. I’ve combined thousands of acres of it. Reckon it breaks down between then and becoming a loaf of bread? What about the hold periods of some pesticides? Some are as long as 18 months or two years. Could it be that something that stays in the ground and is effective that long is dangerous for life? I have taken the commercial applicators liscense test and the instructor for it told is of pesticides that failed on the market because the sprayer operators couldn’t feel their arms for a couple days, thus refused to use it. 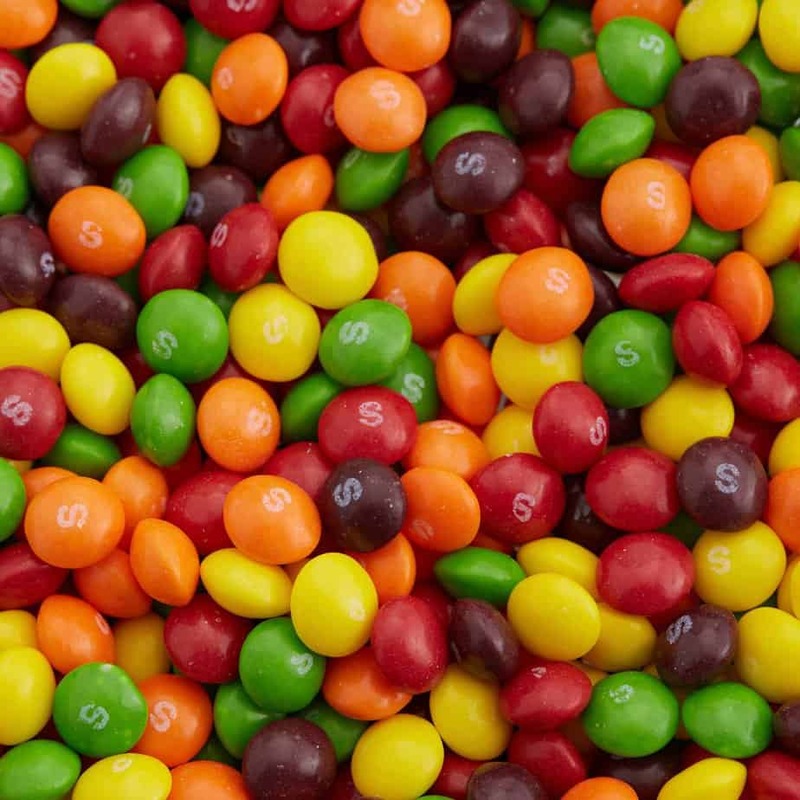 These were approved pesticides. Perhaps we as farmers should spend some time reflecting on the ‘why’ of things and not so much the ‘how’. As a farmer I also know that WHO has caffeine and several other things I use or consume on an average day listed as probably carcinogens as well. Alcohol is listed even higher as a carcinogen if I remember correctly. So when you stop just looking at the headline and look at the whole picture, it’s not the same picture. As far as it being used on cereal crops, you seem to imply that it’s common practice to use it as a desiccant. From my reading and conversations, that is far from the truth and is instead used when harvest conditions aren’t good because of weather. When it is used, does it break down? I’m not sure but I do know that the loaf of bread we buy at the store doesn’t contain any parts of the plant that would have been exposed to the spray. I can’t really speak to other pesticides as I’m not a licensed applicator or an agronomist and it’s not an area that I know extensive amounts on. Thank you Carrie, I appreciate your reply. I am aware that caffeine and alcohol are also listed by WHO as possible carcinogens, the listing of glyphosate is just one that caught my interest because I am around it so much and it’s use is so common. So I have been asking people that use it their reaction. Also I wouldn’t say roundups use as a dessicant is common, it’s mainly only used in Montana, North Dakota and Canada where they can get caught by snow/ice/bad weather before harvest is over. (Snowed on the wheat in sep 2014) It’s reccomended that you wait 7 days before harvest post application. I’ve cut it before that, when it was used to kill green weeds that came through. Yes it does contact the seed head. how much is absorbed? Couldn’t say.